Trust the oddsmakers on Northwestern. It’s already Week 9. Time flies — unless you’re a Tennessee fan. Then, it is moving quite slowly. These picks went 3-4 ATS last week. They are 27-23-1 ATS on the season. Here’s who we like for Week 9. Penn State has an impressive regular season winning streak. Beating OSU in Columbus is a different order of magnitude from the challenges they have faced thus far. PSU hits the road coming off an emotional, whiteout win over Michigan. Ohio State is off a bye week and has film on the packages Penn State unveiled against Michigan. 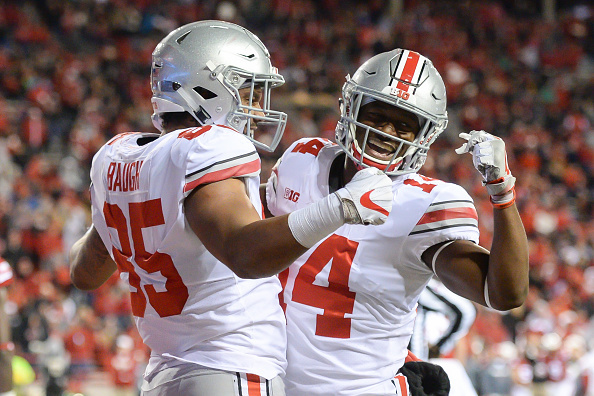 Ohio State has one of the nation’s top defenses limiting big plays. If the onus moves to finishing off drives, making throws under duress, and getting consistent yardage play-in, play-out in the run game, that won’t play to Penn State’s strength. Big win for Louisville at Florida State last week. That makes this a letdown spot in a second straight road trip. These teams are even. S&P+ has Louisville a slight dog in this game. Wake should be able to move the ball well against the Cardinals’ defense. Most teams do. Louisville can struggle and become one-dimensional against teams that have a formidable defensive front. Wake Forest has that. Lamar Jackson can be Superman every week. He has had to be to keep Louisville in games. This line indicates the oddsmakers know something. Trust them. Michigan State heads on the road for a look-ahead game before Penn State. The Spartan offense leaves much to be desired. This team has scored more than 18 points against a Non-MAC team once. Michigan State has ridden a bit of luck. All four Big Ten wins have come by a touchdown or less. The Wildcats are rounding into form off two-straight wins. Michigan State should expend a lot of effort running into Northwestern’s run defense without much success. Wildcats edge one at home. Texas A&M is a fortunate 5-2. Mississippi State has been a much better team (No. 19 vs. No. 60 in S&P+). A low-efficiency A&M offense squares off against a high-efficiency Bulldog defense. Expect three-and-outs. The Aggies gave up 5-plus yards/carry against Arkansas, Alabama, and Florida which does not bode well against Mississippi State. That famous Texas A&M 12th man? It does not show up in the results. The Aggies are 7-17 ATS at home since 2014. The typical play here would be West Virginia. Morgantown is the hardest away trip in the Big 12. This game has shootout potential. Reason says to take the points. However, we saw West Virginia’s defense collapse against Baylor. A failed two-point conversion foiled an epic fourth-quarter comeback. The Mountaineers rank 127th nationally in allowing explosive pass plays. That’s not ideal against Oklahoma State. The Cowboys should pull away in this one. Washington is excellent against the pass. Arizona State’s pedestrian 6.0 yard/att in the Huskies’ last game was they’d allowed all season. The Huskies have allowed just one touchdown pass in their previous six games and none in Pac-12 play. All UCLA can do is pass. Teams can slow down the Washington run game and put pressure on the passing game which has struggled. UCLA, with at or near the worst run defense in FBS, is not one of those teams. Few teams need a catharsis more than Michigan. The Wolverines are back home after consecutive road trips. They face a Rutgers defense ranking 123rd in sacks, 128th in tackles for loss. The Scarlet Knights’ offense ranks 127th in yards/pass and 128th in yards/att. So they are going to rely on an average rushing attack against Michigan. Last year, the Wolverines won 78-0 at Rutgers, stopping 17/17 third down attempts and holding the Scarlet Knights to 39 yards of total offense.